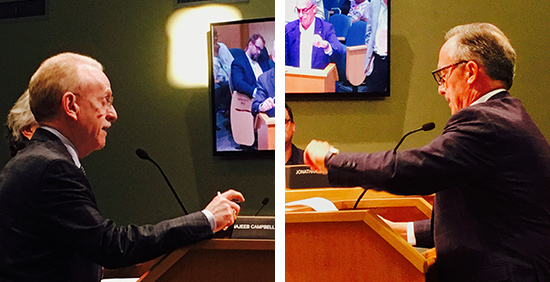 After discussing the issue for four hours on Tuesday afternoon/evening, the City's HEP Board (Historic and Environmental Preservation) approved of the Certificate of Appropriateness for the current Master Plan for the Coconut Grove Playhouse (you can see the plan here), even though, oddly enough, the board, nor their staff, saw the final plans. But the board does have final approval on all aspects of this project, which will be brought before them again in the future before anything goes forward regarding demolition and construction. Hopefully, they will see the plans before they vote on future approval of this project. They will have to deal with each building separately. They did have questions on the size of the garage and whether some aspects met with Miami21 guidelines. And yet, they approved the COA. At odds all evening was the issue of whether a 300 seat playhouse or a 700 seat playhouse should be built or renovated and that was another major issue, should the whole playhouse be restored or just the front section? The current plan calls for just the front section, while the rest will be rebuilt, not restored. Richard Kiehnel, famed architect of Kiehnel & Elliott, who created the original building in 1927, built it for movies, not theater, in future years, it was retrofitted and changed to house live theater by another famed architect, Alfred Browning Parker. One audience member at Tuesday's meeting, said it best, the final plans look like a mixed use property with a theater inside it. And if you look at the plans, you can see that the garage, restaurant and retail do overtake the space. The current crew, guided by Michael Spring, who runs the County's Cultural Affairs office felt that the front "winged area" on the corner of Main Highway and Charles Avenue is the important part and that the interior does not have to be historic to call the playhouse historic. But others disagreed and felt that the main theater is where all the magic happened over the years. Architect of the current incarnation, Jorge Hernandez, claimed that the interior lost its integrity when it was renovated in the 1950s. Architect Richard Heisenbottle, called the current plans "demolition for convenience." He along with authorities from the state of Florida felt it could all be saved and restored in full to its original 1927 state. He claimed the county did not lift a finger to protect the playhouse in all these years and while Michael Spring claimed they did, I know personally, that friends of mine took it upon themselves a few years ago to close up holes in the playhouse and paint what was dilapidated wood on the sides of the structure. Until recently water was running on the roof, getting inside the structure and I personally saw to it that the water was turned off and the flooding was taken care of, so I find it hard to believe that the county cares about the structure other than monetarily. By the way, Heisenbottle came up with his own plans in 2013. You can see them here. One of the men from the Florida Trust for Historic Preservation said that the Coconut Grove Playhouse is on a list of most endangered buildings in Florida. The Trust is willing to work with Spring's group, which includes local architects Arquitectonica along with Jorge Hernandez. Hieisenbottle said that the Playhouse building meets the criteria of Chapter 22 for historic preservation - the whole structure. He claims the current report is flawed and that the interior should be included with the exterior. He was in the playhouse in January and assessed what he saw, he claims it could all be restored. He says while the historic parts have been covered up by insensitive renovation over the years, that could easily be undone. "The auditorium is the heart of the building," he said, "The front part counts as storefronts." The audience had their say and it seems that consensus in Coconut Grove is that people want the original playhouse back, they don't want any part knocked down. They don't want a garage and condos as part of the project and traffic concerns them. "Residents are always an afterthought." "Big projects have ruined the Grove." "The new apartments/lofts do not benefit the community." And as I said before, "It's a mixed use develpment with a theater inside." More than one person said that the 2004 Bond Initiative voted on by the public stated that the $20.5 million restoration bond was to be used for the playhouse renovation, NOT replacement." While the public wants a larger-seat theater, Joe Adler, who is to be the artistic director of the "new" playhouse said that 300 seats are perfect in size. He said the "new" playhouse will be state-of-the-art, ADA compliant and something people could be proud of. In the end four out of the five committee members voted to allow for the project to proceed, but with changes along the way. There will be no demolition permit, so things cannot be knocked down without the board's approval. Lynn Lewis was the only member of the board who voted against issuing the Certificate of Appropriateness, she felt there were too many questions. The rest of the board, Chairman William Hopper, PHD, Jonathan Gonzalez, Todd Tragash and Najeeb Campbell all approved. The community who was at the long four hour meeting left feeling dejected and sold out again. People are frustrated with the direction that Coconut Grove is going. I never understand what the point of the HEP Board is, they are supposed to protect history and preserve things, but they never do. It's a shame that most of the Playhouse will be demolished. The Playhouse isn't just the front façade, but the whole building, including auditorium. It would be one thing if the auditorium was beyond repair, but you have a preservation architect - Richard Heisenbottle - who backs up that the whole structure can be saved. The original design of Kiehnel was not removed, but only covered up. So destroying the auditorium would only erase history and it wouldn't be the Playhouse anymore. April 05, 2017 8:42 AM, I totally agree with you this is a very important fact in which is being ignored by the new plans as they want to do what they want by providing the minimum necessary information to the board. Ah Miami, where historic structures are knocked down willy-nilly and developers line the pockets of local politicians. I wonder if the state and county's inaction on the property for so many years was part of a scheme to hope that the public forgot the playhouse even existed. I support the plan EXCEPT for 1) the height of the residential portion; 2) the lack of passenger drop off and turn around; 3) the lack of bus parking (risking a line-up of buses on Main; 4) removing trees, which they plan to do. Business as usual in the Banana Republic a/k/a City of Miami. What is everyone complaining about (again)??? That you get a brand new theater in your backyard that you don't have to pay for and that will raise your property values even more and that the dilapidated buildings along Main Highway, which are the first things people see when entering the Grove from Main Highway, are finally getting torn down and replaced. The horror of it all!!!! We only get a 300 seat theater and not a 700 seat theater and they are only restoring the exterior and not the interior (even though you have no idea the condition of the interior or the actual cost to renovate it....also....please don't forget that while Mr. Hiesenbottle is an established restoration architect, he has his own addenda as he wants to be awarded the job instead of ARQ) I don't know what you are worried about...the tickets prices will probably be in line with the $12 milkshakes at the new Lokal restaurant and the seats will be as uncomfortable as the benches in Regatta Park, and the design will be ugly, and blah blah blah.